Good to see Thor Hushovd ride back to form winning the Norwegian National road race for the third time this past weekend. He also won in 2004 and 2010. 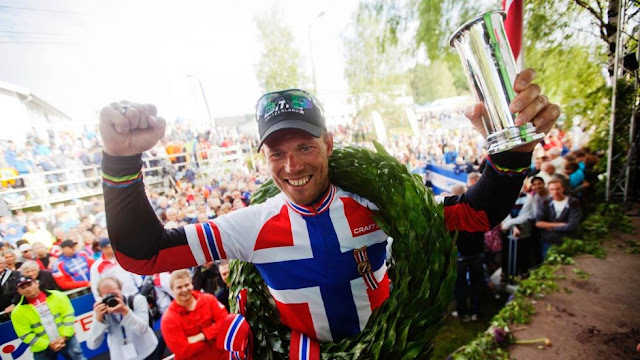 Hushovd continued his winning form in the Norwegian championships adding a gold in the team time trial and a silver medal in the individual time trial. He has rode in every Tour for 11 years until last year. He is a two-time green jersey winner and has banked 10 stage victories. No question - solid Tour credentials. I'm sad that he won't line up in Corsica for the 100th edition and I can't help but feel that BMC will miss him. It is unfortunate that he wasn't selected. Thor seems to be riding stronger than he has in quite some time.